Still not sure why you would want to do a temporary cast on edge? 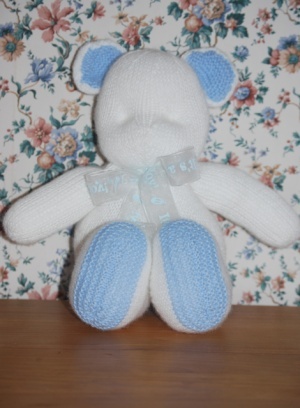 One example of where I have used this cast on edge is for the arms on Baby's First Teddy Bear. Using a provisional cast on allows me to gather the stitches at both ends of the arm so that they look the same. I have also used a provisional cast on for knitting a patterned scarf. The cast on edge is at the centre, I knit from the centre to one edge and then pick up the stitches on the cast on edge and repeat for the other side. This allows me to knit both sides the same way. 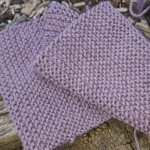 For some patterns, if you knit from one end to the other it looks like half of the scarf was knitted upside down! Start by making a slip knot loop on the crochet hook. Hold the knitting needle in your left hand, and the crochet hook in your right hand. The first time you do this it is probably going to feel a bit uncomfortable, but it will become much easier with practice. Bring the yarn under and behind the needle, with the crochet hook in front of the needle and pick up the yarn over the top of the knitting needle. Pull a loop through the loop on the crochet hook to form a stitch on the knitting needle. Take the yarn back behind the needle and repeat until you have the desired number of stitches cast on. Break the yarn and pull a large loop through the last loop on the crochet hook. Don't tie it off too tightly, as you will use this end to unravel the chain to recapture your stitches when you are ready to knit down. 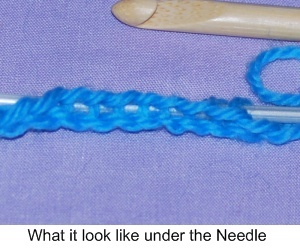 Using a crochet hook make a chain about ten stitches longer than the number of stitches required for your cast on edge. Lay the crocheted chain down on a flat surface with the right side down. At the back of the chain (wrong-side), you will see a series of loops connecting the stitches in your chain. 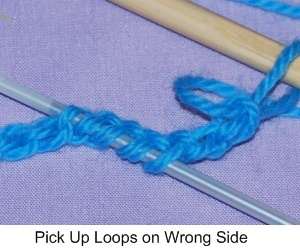 Take your knitting needle and starting a few stitches past the slip knot pick up each of these loops until you have the number of stitches on the needle that you need for your cast on edge. Purl each stitch on the needle with your main colour (this does not count as a row). Just undo the last stitch on the crochet chain (or pull the yarn back through the last loop if you used the 'proper method') and gently tug on the yarn. 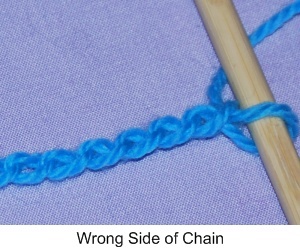 Your chain should unravel and separate from the first row of knitting. You can then use your knitting needle to pick up all of the stitches from the lower edge.